Samsung A Galaxy Event highlights: Samsung Galaxy A70 and Galaxy A80 launched globally, will soon be making their way to India. 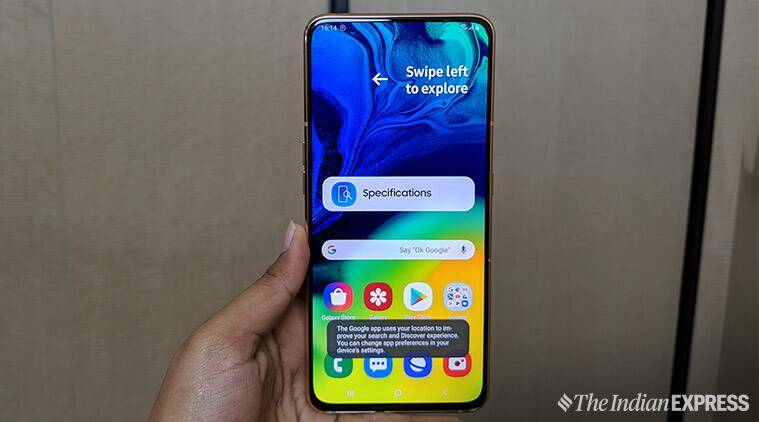 Samsung A Galaxy Event April 2019 highlights: Samsung has launched two new Galaxy A-series smartphones – Galaxy A70 and Galaxy A80 at its ‘A Galaxy’ events in Bangkok, Milan, and Sao Paolo. The Galaxy A80 and Galaxy A70 feature different features and specifications. We expect both the smartphones to launch in India sooner than expected. The company has also merged its Galaxy J-series into its Galaxy A series of smartphones. Out of the two, the Galaxy A80 is the company’s first smartphone with a rotating camera. This phone is also the first smartphone to be powered by Qualcomm’s newest Snapdragon 730G processor, which is optimised for mobile gaming. Meanwhile, the Galaxy A70 is a mid-range device. Samsung Galaxy A80 is the first smartphone from the South Korean company to feature a rotating pop-up camera. The setup consists of a 48MP primary camera, 8MP ultra-wide camera and a third 3D Time of Flight (ToF) sensor. The Galaxy A80 will be powered by the Qualcomm Snapdragon 730G processor coupled with 8GB RAM and 128GB storage. The Galaxy A80 will compete with the likes of Vivo V15 Pro and OnePlus 6T.